Big congratulations to new league champion Anthony Price and his Rams for his victory over Perry Burke’s Cowboys in The Show 2018. THE SHOW 2018 IS SET. ARE YOU READY? 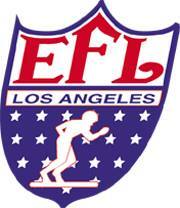 The LAEFL 2018 Championship game day is all set for Saturday August 4th at the Sherman Oaks Galleria. Games start @ 0900 – until. Don’the forget this year’s road trip to visit league members Jeff Eby, Dave Campbell and our Bay Area EF brothers. Put in for Friday off, plan it now. It’s one hell of a three day weekend. Good people and good times. Don’t miss out. You deserve the time to enjoy this hobby and bond with your league members. Take a break from life and enjoy some EF. Be sure to click on the League Champions link to see the list of LAEFL champions from season one to current.